Goshen drivers prefer vehicles that deliver eco-friendly options. The Honda Accord Hybrid model is one of the most attractive hybrids on the Monticello roads. With 47 highway and 49 city mpg, you can rely on this vehicle to get you where you need to go on one tank of fuel. This vehicle also includes an industry-first two-motor hybrid system that uses one engine to start the vehicle from a stop and the second to charge the first motor. Throw in the impressive Honda Sensing™ safety system, a 360-watt audio system, and a satellite-linked navigation system, and you have a new vehicle you can’t live without. Delivers 48 Highway MPG and 48 City MPG! This Honda Accord Hybrid delivers a Gas/Electric I-4 2.0 L/122 engine powering this Variable transmission. Wheels: 17 Machine-Finished Alloy, VSA Electronic Stability Control (ESC), Vinyl Door Trim Insert. 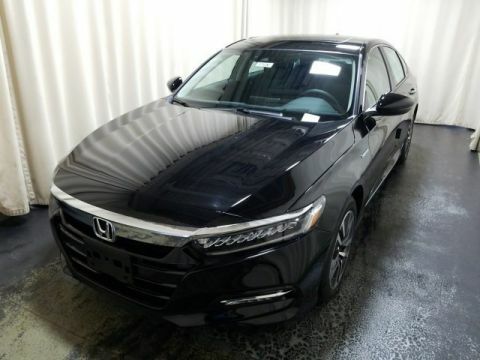 * This Honda Accord Hybrid Features the Following Options *Valet Function, Trunk Rear Cargo Access, Trip Computer, Transmission: Electronic Continuously Variable -inc: 3-mode drive system (ECON/sport/EV) and deceleration paddle selector indicator, Tires: 225/50R17 94V AS, Systems Monitor, Strut Front Suspension w/Coil Springs, Speed Sensitive Rain Detecting Variable Intermittent Wipers, Spare Tire Mobility Kit, Single Stainless Steel Exhaust. * Visit Us Today *Live a little- stop by Middletown Honda located at 520 Route 211 E, Middletown, NY 10941 to make this car yours today! The only way to truly understand how impressive the Honda Accord Hybrid model is would be to see it in person at Middletown Honda. Visit our dealership at 520 Route 211 E in Middletown, NY to see our inventory, or contact us at 845-343-0055 to learn more about our current vehicle specials.